Editor’s note: This article on establishing student organizations that are explicitly for White students is reposted with permission from the National Youth Front website. 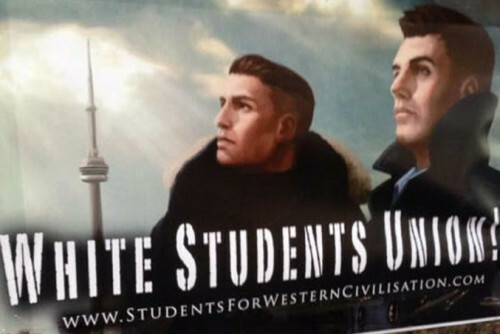 They also have an article on a story from Canada where someone claiming to represent the Students for Western Civilization distributed the above poster around the campus at Ryerson University, the University of Toronto, and York University. The simple action of putting out these posters caused a moral panic in Canada, where the story received national coverage, including an article on the CBC website. The piece [by Students for Western Civilization] says that York University students are indoctrinated by “neo-Marxism” and that “neo-Marxists identify white people as oppressors and everyone else as ‘the oppressed.”‘ It says a white students’ union would promote and celebrate the culture of western civilization. Investigative Reporter Peter Fricke recently uncovered some interesting details on a university’s control of free speech and student organizations. 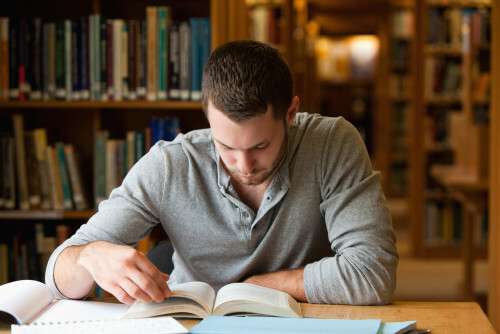 His article, which exposes a student’s “realistic” freedoms as they pertained to the University of South Carolina (Columbia), appeared on the Leadership Institute’s website Campus Reform, a popular college news outlet (see “South Carolina Student Group Stymied by Free Speech Zones, Sept. 8, 2015). The story line centered around a Libertarian leaning political activist group, Young Americans for Liberty (YAL), and the challenges they faced in arranging on-campus meetings, recruiting new followers, and expressing their political view points in public. Now at face value, a young person could read this article and come away thinking how unfair or unconstitutional it is for a publicly funded university to create such a labyrinth of obstacles in its effort to bureaucratize the rights of speech and association on campus. But if one digs deeper, there’s a side story that’s even more important to our readers here: These YAL members may have been shocked into the realities of restrictive speech and association, but their challenges are by no means insurmountable. On checking their national website they boast of over 500 existing chapters in colleges across our nation. Clearly, these Libertarians and conservatives have a voice that can be heard by all young adults as they spread their message. And since they have gained official status as a “registered student group”, there must be hundreds of college professors or staff that are sponsoring these local YAL chapters. So even though it may not be easy, YAL has been sanctioned by the collegiate system to exist and spread. In fact, a prominent politician whose organization inspired YAL, Dr. Ron Paul, was able to have a mainstream presence in his running for the Presidency in 2012. In effect, it is politically correct (PC) and okay to form a YAL chapter. So let’s continue the side story: It is not politically correct in the U.S., especially if on a college campus, to organize as a group representing European-Americans. One may privately engage in conversation about White interests with other like-minded individuals, but organizing for your interests is out of the question. Finding a university staff member to sponsor your group will be incredibly difficult, for their tenure or employment will ride on the persona they present. Few will take that risk. If one starts making progress as with Matt Heimbach’s White Student Union at Towson University, MD the group will come under attack and be demonized by gatekeeper organizations like the Southern Poverty Law Center (SPLC) and the Anti-Defamation League (ADL). Yet, there are recognized student organizations and unions representing almost all ethnicities, cultures, religions, hobbies, academia, special interests, politics, and yes, race. To cite a few representing the racial, ethnic and cultural, one can find clubs such as the Black Students Organization, Chicano Caucus, Chinese Student Club, Latina Center, Asian American Alliance, Hillel and Chabad (Jewish Student Associations), Turkish Students Association, Vietnamese Student Association, and countless more. So why is there such stark discrimination against the majority of Americans, the descendants of Europeans? This is the puzzle that has woken up National Youth Front’s very own Angelo John Gage, Nathan Damigo, as well as the author of this article – all veterans of our nation’s wars in the Middle East who passionately understand the meaning of sacrifice as it pertains to upholding their oath to this nation (see the NYF website). If the Civil Rights Movement of the fifties and sixties intended to swing the pendulum of “opportunity” and “rights” towards a more balanced center, then the ironic result is that it has now swung through neutral and clear to the other side. It is blatantly obvious that every group of students has been encouraged to embrace their ethnicity, their heritage, their culture, their values, i.e. their identity on campuses nationwide — save one: Whites. And this makes it more and more apparent that perhaps fairness, equal rights and true meritocracy were never the real objective in these last sixty years, but rather a more duplicitous form of vengeance. In essence, the “System” has convinced most minorities and even White people themselves that European-Americans are to be blamed for everything wrong in this world. And their anger is readily visible every day in the press and on social media. Hence it should be noted that the formation of National Youth Front took a courageous step in countering the daily bashing and defamation of White people, especially as it pertains to our college youths. Hopefully NYF will inspire the next cadre of emboldened young people to take the important step in joining together in large numbers to form the recognized White student associations that they deserve … for European-Americans are indeed unique, and truly a part of our diverse human world. As individuals and as a group, their voice deserves to be heard and they should have the right to reclaim their identity. Their right to association on campus currently does not exist in the mainstream, and thus they are being denied benefits given to all other parties. So as it stands today I see the score being tallied: Young Americans for Liberty — 500, Americans with White parents — 0. Maybe our future will hold a more inclusive Neo-Political Correctness where Whites, as the minority they are soon to become, will no longer be a target to be marginalized out of existence.